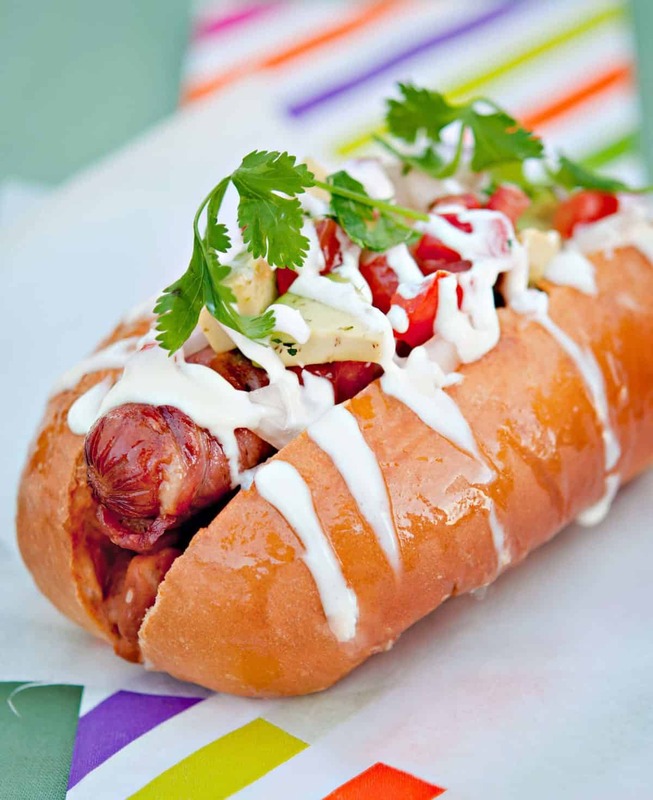 Sonoran Hot Dog Recipe takes the All-American hot dog, wraps it in bacon, smothers it the flavors of Old Mexico—pinto beans, salsa, Mexican crema and avocado pico de gallo— then piles it into a soft roll for an Easy Grill Recipe. Watch out, Chicago, there’s a new dog in town! Every great city has a great hot dog. You’ve heard of Chicago Dogs, New York Dogs, Dodger Dogs, Kansas City BBQ Dogs… well, let me introduce you to the dog that will beat them all, Tucson’s very own Sonoran Dog. Yep, tiny little Tucson has the bacon wrapped, bean stuffed, avocado pico de galleo topped hot dog that puts power house cities like Chicago under the table. I mean really? How can “glow in the dark” pickle relish compete with grilled bacon and avocados? Our family eats an awful lot of bacon wrapped Sonoran Hot Dogs during grillin’ season because they are quick and easy to make so I don’t have to sweat over the grill and I can enjoy my own party. This Sonoran Hot Dog Recipe is impressive enough to serve to guests yet, easy enough for a weeknight meal. Let’s face it, they are the best hot dogs on the whole darn planet. If you are lucky enough to live in Tucson, or lucky enough to go there for vacation, you can have your choice of great places to grab a Sonoran Hot Dog. My personal favorite is Fatdogs Real Mexican Hotdogs , a hot dog stand out in the boonies on Thornydale and Overton Road, near my parents home. They also have a new place indoors at the Foothills Mall. Google them for their newest locations. If you aren’t lucky enough to live in Tucson, well, you’ve come to the right place to find step by step directions on how to make this authentic Bacon Wrapped Sonoran Hot Dog Recipe… even if you do live in Chicago. First of all, choose bacon slices that are not too thin, not too thick so they will not burn before the dogs are grilled all the way through (don’t use the microwave ready bacon, it is too thin). Then, wrap a slice of bacon around each hot dog and secure with a toothpick on each end. Refrigerate until ready to grill. Use raw bacon, not the ready to eat bacon. Have all of the ingredients ready before you put the hot dogs on the grill, they cook quickly and you will want to serve them when the bacon is crispy. Be sure make the salsa and pico de gallo ahead of time then, chill until ready to grill. Dice the avocados and toss with a little lime juice to keep from browning. In a sauce pan, bring the beans to a boil. Reduce temperature and simmer. Finally, grill your hot dogs and assemble the Sonoran Hot Dogs. Don’t just throw the same ol’ burger and dogs on the grill this season. It is so easy to to kick them up a notch with this Bacon Wrapped Sonoran Hot Dog Recipe. Trust me, you’ll love them.If you aren’t in a “hot dog kind of mood,” here are a few of our other grill recipes that you might like to try as well as a few great recipes from our foodie friends. Be sure to subscribe Everyday Southwest’s email notices to recieve future recipes delivered right to your email inbox. You can follow me on twitter or Facebook. We love hearing from you so let us know what kinds of recipes you would like to see more of on Everyday Southwest. Tucson's very own bacon wrapped, pinto bean and avocado stuff Sonoran Hot Dogs are the best dogs on the planet. Ya, New York, I'm talkin' to you. Wrap one piece of bacon around each hot dog and secure on each end with a toothpick. Refrigerate until ready to grill. Open cans of beans and heat to a simmer. Drain beans in a strainer over a medium mixing bowl, keep warm. Toss diced tomatoes, onions, cilantro together, set aside. Grill bacon wrapped hot dogs over medium heat until bacon is crispy on all sides, but not burned. Make sure to cook slowly and turn the dogs often so that the hot dogs are heated through by the time the bacon crisps, about 10 minutes. Spoon the mayonnaise into a ketchup type squirt bottle. Thin with milk, a little at a time, if necessary. Dice avocado and toss with lime juice. Toss into the tomato mixture. Assemble the hot dogs by spooning beans into the bottom of the hot dog bun. Add the hot dog and top with the avocado pico de gallo. 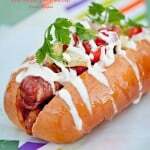 Drizzle Sonoran Hot Dogs with mayonnaise. 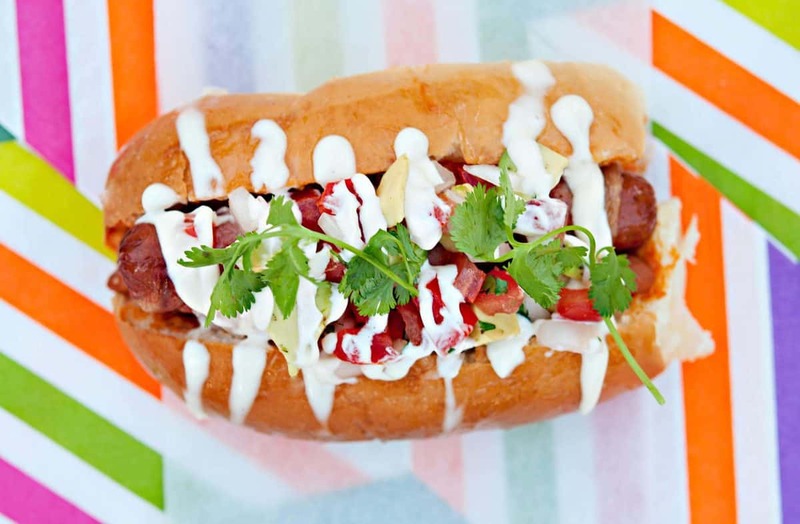 Gotta love a jazzed up hot dog. These are great! Thanks, Lori. This is a great dog. All it needs is your Mango Slaw! Sandy, bless you for making this bit of Sonoran heaven so doable! I love sonoran dogs! This makes me miss Tucson. Happy to meet another blogger with ties to Tucson! I miss it, too (even though it is only a couple hours down the road). And the Tucson food!! Much better than Phoenix with a lot more “Mom and Pop” restaurants that serve authentic Sonoran-style Mexican food. Okay seriously, this might just be the best dog I have ever seen! I mean, beans, bacon and avocado? I’m dying here! Really, you must try this hot dog. It will become your absolute favorite! Oh you know how to dress up a hot dog. I think I know whats for dinner tonight! They sound tasty and so easy. Had them last night, Loved them! I’m so glad you liked them! Thanks for coming back and letting us know. Bacon , beans, avocado and a little chipotle mayo… oh my! These look SO GOOD I need one now, right now, though I’m out of hot dog buns. Today’s impromptu version will have to be wrapped burrito-style in a warm tortilla instead. I’ll think of Tucson while enjoying this treat. I’m doing a featured food blogger recipe slideshow of all hot dogs for Kitchen Daily. We’d love to include your Sonoran hot dog recipe. Can we have permission to use the photo? We will link back to the post of course. These look amazing! I can’t wait to try them. I have one question though, are “ranch” beans baked beans? Please forgive my ignorance. Thanks so much! I already ate dinner, but could totally go for one of these RIGHT NOW! Gotta try ’em! My mom came up from Tucson a few months ago and she was telling me about this. So I took her to a diner here in Lincoln Ne that has been making these for about twenty years. And come to find out that it is popular in many places in Canada and other places in the Northern states. Hi Blanca, Yes! I’m so happy that these hot dogs have caught on and are spreading across the nation. Watch out, Chicago! These are not Tucson’s hotdogs. These are what Mexican immigrants brought to Arizona from the neighbor state of Mexico, Sonora. These hotdogs were created in Hermosillo city and they are the after party fast food by excelence. There is a big plaza called Hotdog Park (parque de los dogos) where there are docens of hotdog stands each with unique variations of the recipe. If you ever go to Hermosillo the one in the photo is meek in comparison. So this is a hotdog for a great city in Sonora, Hermosillo not Tucson. My cousin lives in Tucson right at Overton and Thornydale and I have eaten many of those wonderful dogs from that shiny silver truck while vacationing there over the past 3 years. I have brought this wonderful treat back to my friends here in Canada. Hopefully they will catch on across the north! Hi Rob! So glad to find another Fat Dogs fan! Did you know they even have a small restaurant in a near-by mall? Yep! Their hot dogs are THAT good. I hope they do catch on with our neighbors to the North. Be sure to stop by the blog and say, “Hi” again! Thanks for the tip! We are in Portland every now and then and will definitely look them up! Thanks for the recipe! I might have to make these with that mango salsa you suggested. The bad thing is I am hungry now ;-). Hi Shell, Thanks for stopping by the blog! 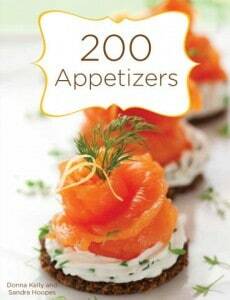 Be sure to try this recipe, you will love it. OMG! With 3 boys, we tend to eat tons of “junk” like hotdogs, hamburgers, pizza, etc. TBH, I am sick to death of it. However, I stumbled across this recipe and it changed my life. Now, I don’t feel like I am eating a baseball dog! This was so yummy, it really felt like a gourmet meal! Made this today and it was a hit!! I used French rolls in place of a hot dog bun, homemade green salsa, hot dogs made from Angus beef and applewood smoked bacon. I also substituted great northern beans in place of pinto, but seasoned them according to the recipe. I will definitely make this again!!! 10 out of 10 stars.